« What color tie to wear to a wedding with blonde hair? Should i get a bob hairstyle? [Photo included]? By zara | August 13, 2011 - 10:49 am | August 13, 2011 What will you look like? My hair is pretty damaged due to constant dying and straightening. But it’s still ooo-kay. 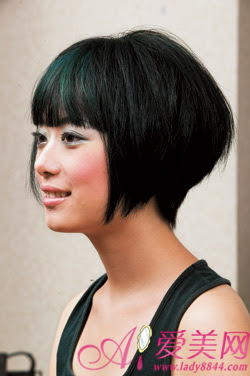 I want a new look, i want to try a bob, maybe concave at the back and the front is a wee bit a-lined. But problem is, my natural hair is kinda thick and curly (i straightened it for long hair), i am afraid it’d curl in a mess if i cut them short. Moreover, my cheeks are chubby, i scared i’d look like a dumbo if i get bob ..i’m in a dilemma. Any ideas? Tagged cheeks, dilemma, dumbo, kay, long hair, natural hair, png, roots, wee bit. Bookmark the permalink. 10 Responses to Should i get a bob hairstyle? [Photo included]? Just get all the dead ends trimmed off. It might result in shorter hair but since you’re going for a bob, you shouldn’t mind, right? I don’t think a bob is right for you. Try some short layers that curve toward your face. Or if you’re going to do a bob, try an inverted one. For short, curly hair, here’s a look that can be so cute. Put in some curl definer and flip over and blowdry with a diffuser, while scrunching with your free hand. But like I said, your hair will look better longer than in a bob. I would go with the trim. Or you could do a long bob. (Yes, that exists.) As for dying it, don’t. It looks beautiful as it is. Awwww, your cute. And I like your hair! I think the hair you have in the picture is nice. I don’t think you should get a bob. Keep the hair you have now…its nice. do not get a bob ! it would be way too harsh for your face shape. i think your hair looks gorgeous right now the way it is. Yeah, highlights would be a nice touch, even if its a natural look. No. You should keep the length you have. I think your hair is pretty. Get the bob. btw…I am asian too, what colour do you use? ?